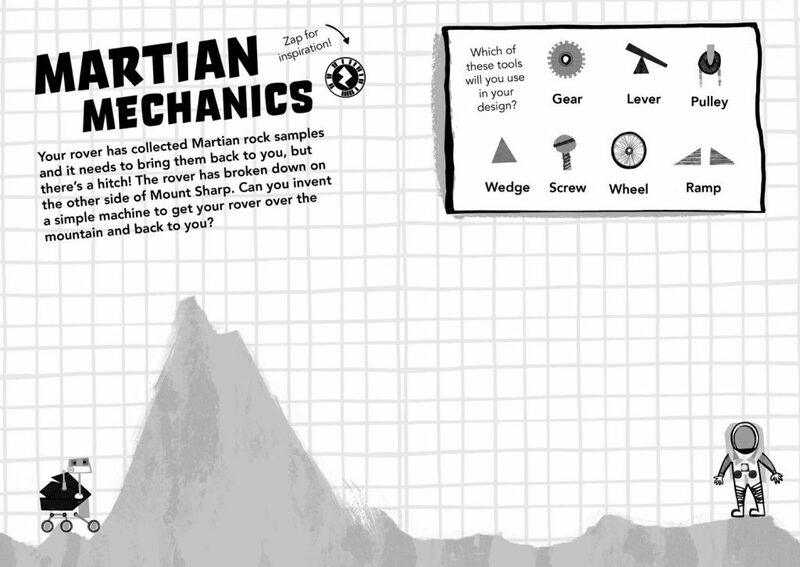 Here we look at each activity in Chapter Four: Science on Mars. Creative writing: Ask your students to each write a diary entry titled ‘A day in the life of the ExoMars rover’. Encourage consideration of challenges it might face in terms of obstacles or weather and if parts break. Include the rover’s communication to and from Earth and suggest students consider the rover’s tone of voice. Is it robotic or more human-like? What information is the rover looking for and how does it report back to Earth? Report writing: Make a 3D Martian landscape including a model ExoMars rover. Students could make it with Lego, papier maché or as a dioramas — or give them total creative control, we’ve seen students make 3D cakes before! Alongside the model students should provide a report about the Martian landscape and why ExoMars is so well-equipped to deal with the conditions. 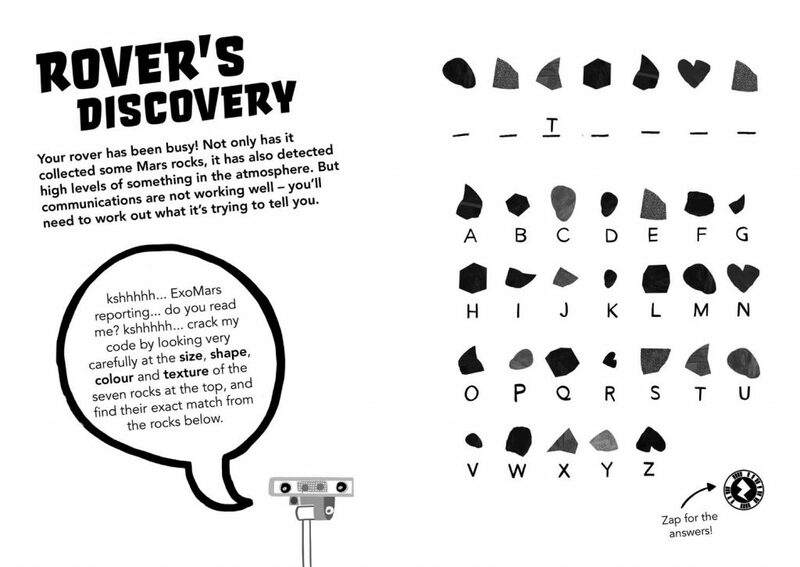 This activity uses the premise of rock samples collected by the ExoMars rover to help students practise their visual differentiation skills to crack the code. It also provides an opportunity for students to consider the differences between robotic and human exploration. What are the strengths and weaknesses of the two different types of explorer – and how could they best work together on the surface of Mars? Students should create their own message from the code to test a friend. Ensure the word is connected to Mars (e.g. rover, Olympus Mons etc.). This could also be set up as a daily activity on a display board where the teacher offers a new Mars word challenge every morning or before every Mars lesson. Words could start small and lengthen to increase the challenge. Develop a similar code based on rock samples. Children can draw their own rock samples for each letter of the alphabet and create words or paragraphs for others to solve. Research: Find out why methane is the solution to the code. Investigate the discoveries that have been made on Mars. Collate these ideas into a poster or PowerPoint presentation. 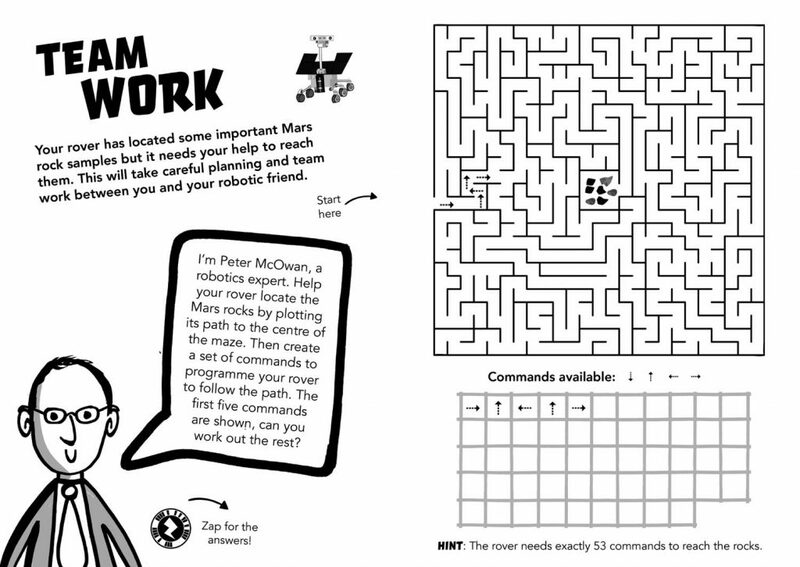 This activity asks students to create a machine to get their rock samples back to an astronaut on Mars. This creative and technical challenge asks students to think about how they would resolve this problem. With inspiration from real-life structural building toys, students will have to construct a machine to bring their rover over a mountain. This is an ideal way to introduce students to forces, structures and machinery. Creative writing: Ask students to pair up and and write a call and response short story, poem, diary entry from both the astronaut and the rover’s perspectives, specifically about this challenge they are facing. Extra students could come in as Mission Control helping to direct the astronaut. Scientific writing: Create a more technical drawing of your machine, fully labelled. 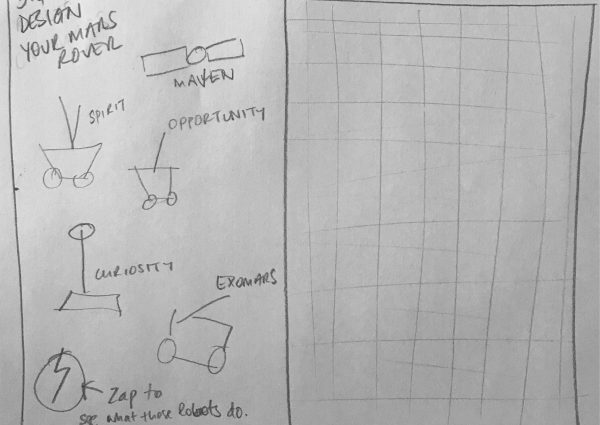 Research: What materials would students make their machines from? Research different materials you would need and why they would be the best. Designing an experiment to test a hypothesis is a fundamental part of scientific enquiry. This chapter builds up to this concluding challenge by laying the foundations for students to investigate the presence of methane on Mars. To finish this chapter, they must consider how they find out where – or whom – it was coming from! 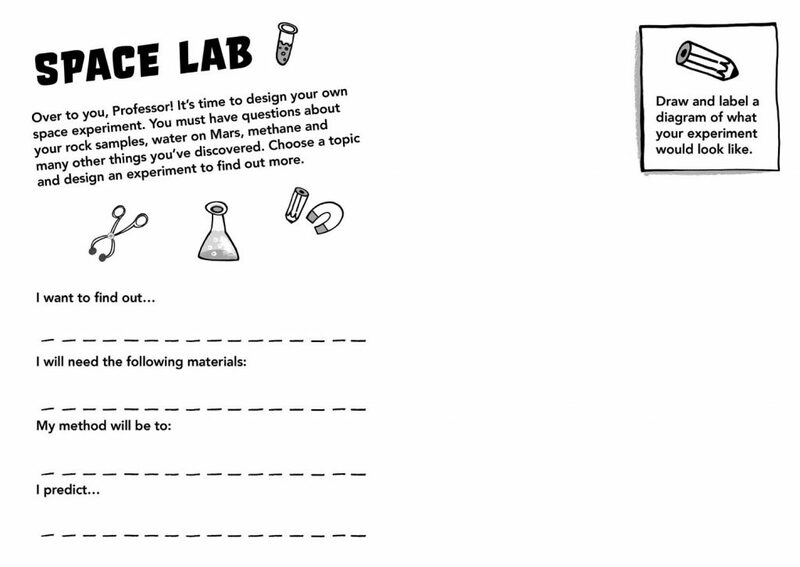 Report: Complete a class experiment, based of the ideas presented in this activity. Students should record the data gathered and write a report of the findings. Brainstorm: Some students will benefit from extra planning time and so the complex scientific ideas are communicated across well. 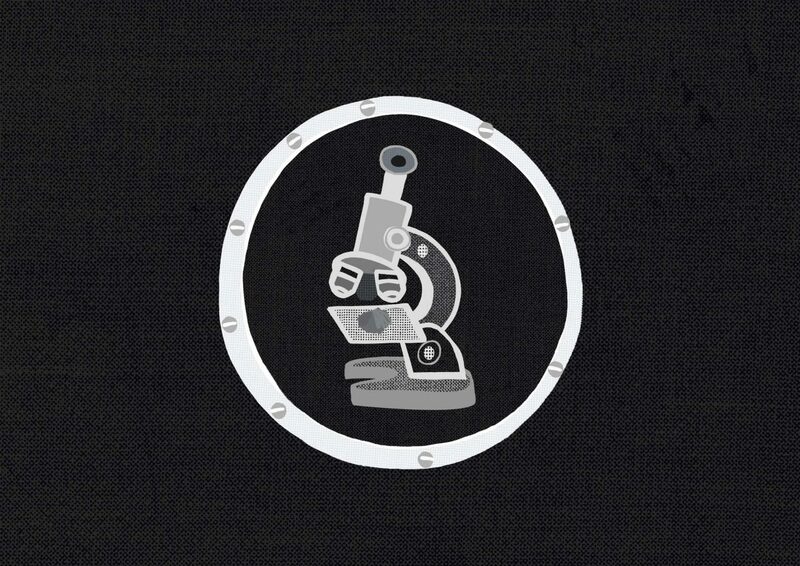 The extra planning time can involve research and allow students to write and brainstorm different ideas of how they think their experiments may go.